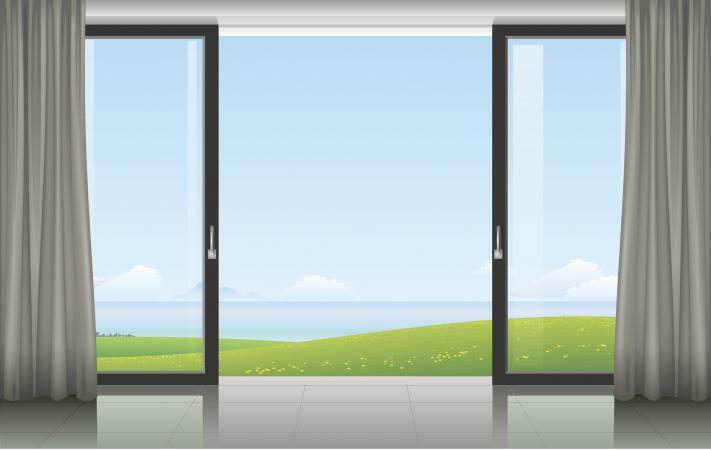 To find the appropriate treatment for your sliding glass doors, you will need to find something that fits within your décor and is also functional, easy to maintain, and can withstand high traffic. There are various types of window treatments to choose from along with several material options, lifts, and colors. Drapes or curtain panels are a simple, affordable window treatment for sliding glass doors. With hardware provided along with a curtain or decorative drape rod, you can measure the desired location of your drapes and use a screwdriver or drill to hang the rod. Once up the drapes or panels can easily be threaded on the rod and moved aside to gain access to the door or tied back with drape holders or ropes. Drapes and curtain panels offer several choices in styles, patterns, colors and materials, such as woven woods, cotton mixes, privacy sheers or polyester blends to block out sunlight and provide privacy. This window treatment is found at most general department stores or online and very affordable ranging from $20 a panel to $500 a panel, depending on materials used and if they're custom-made. It's also a solution for all design styles but typically found in eclectic, contemporary, traditional, and country cottage concepts. Sliding or gliding panels are a contemporary alternative to vertical blinds. They glide on a wheel carrier track that's mounted to the wall or ceiling and have the ability to stack completely clear of the door. They come in various different materials, such as solar screens, fabric, and woven woods. While this window treatment is used in many decorative styles, it's more likely found within modern and contemporary concepts. Installation will require more tools and expertise than other window treatments and it's recommended by manufacturers for installation to be completed by a professional or one of their dealers. Most window treatment dealers, such as Budget Blinds and Ethan Allen, will offer installation for these panels within the price. Since sliding panels are custom-made for your windows and door, this window treatment is expensive. It can cost several thousands of dollars, depending on the materials used, size of your door, whether the panels will slide into a hidden pocket within the wall, and type of carrier track you want (manual or motorized). Shades include a wide variety of window treatments for your sliding glass door. Cleaning concerns may come up, so be sure you understand the proper way to do so before you purchase them. Choose the type that will fit within your budget, style and installation expertise. Roman shades consists of fabric-type materials, often used to black out the sun. They stack up evenly when opened and offer smooth, clean horizontal lines. These shades come in custom sizes that will fit the length of a sliding glass door. As explained by Houzz.com, if you have wall space between the door frame and ceiling, a Roman shade can fold up nicely in that space. When you're ready for privacy at night, with one quick motion, the shades will fully cover the doors. Installation - These shades can be installed using basic tools like a power drill or screw driver along with the hardware that is provided by the manufacturer. It is a two person job and can be cumbersome. If the store or window treatment dealer you purchase the shades from offers to install them, it's best to take advantage of this service, particularly a shade this size. Design style - These shades are often used in Tuscan, country cottage, beach cottage or any other traditional design concept along with some contemporary styles. Cost - They cost anywhere from $400 to thousands of dollars depending on the material (woven woods or fabric), size, and whether you opt for an automatic gliding system. Cellular shades, or honeycomb shades, are another option for sliding glass doors because they not only add decoration to your home but are also energy-saving options. As explained by BlindsGalore.com, cellular shades are energy efficient due to their shape, which keeps the room shielded from the temperature outside. Lift options - These window treatments come with a few lift options , such as basic up-and-down or side-to-side motion that can be cordless or motorized and operated by a remote. They're also available in top down-bottom up lifts where the shades are solid panels, do not roll up, and are pulled up to the top of the door or down by the floor. Cost and installation - Because they're quite expensive, costing thousands of dollars, installation is normally included. Design concepts - These shades are versatile and can be used in all design concepts, especially modern or contemporary plans. You have many choices in patterns and colors of fabrics that can block out or filter light. Rolling shades are a typical, basic and affordable window treatment like curtain panels. These shades are made from various materials, such as polyester, Polyethylene Terephthalate (PET), cotton, linen, solar fabrics and woven woods. You can get custom rolling shades to fit your sliding glass door's length or use two shades of the same length to cover each side. Because roller shades are common, they can be used in all design styles and combined with Roman shades, drapes and curtain panels for more depth and added ambience. Installation - Installation of rolling shades is fairly simple and can be installed with a drill, screw driver, and hardware provided by the manufacturer. Price - The price of these shades are determined by the material you decide to use, whether you'll use a manual or motorized pull system, and size. This can range from $20 a shade to thousands of dollars. Shutters, also known as plantation shutters and interior shutters, create a traditional, country, or beach cottage look for your home. They can be configured with multiple slat and frame options and are constructed of durable composite, faux wood or PVC materials that withstand high-traffic areas. Since they're cord-free, they are children and pet safe. Mounting options - They have a uniform appearance with inside mounts that can be flush with your door casing and fold back against the wall with one simple motion or you can use an easy-glide system. You can also choose to put plantation-type shutters outside where they'll be set above the wall's surface. Cost and installation - Shutters are completely custom-made and more expensive running into thousands of dollars than other window treatments, but they do offer long-term value and increased appreciation to your home. Due to the cost it's recommended to have them professionally installed, which is offered by most dealers. There are two types of blinds used for sliding glass doors: vertical and horizontal. Each one is affordable, easy to install and use, but there are advantages and disadvantages to each. Vertical blinds are the most common, inexpensive, and easy to clean window treatment for sliding glass doors. These blinds consist of 3 to 4-inch wide vanes that are hung vertically from a gliding system. There can be made of vinyl, fabric, faux wood, and wood, and are easy to clean. This style allows the vanes to be pulled nicely to one side for easy entry. You can get these blinds with hand pulled cords or motorized self-pulling system. Vertical blinds are more affordable, and you can purchase blinds for as low as $70, but you'll have to install them yourself. Installation is a two-person job and can be completed using a power drill or screwdriver. Higher-end blinds will offer installation with the purchase at most select dealers. This window treatment is common for contemporary and some modern design concepts but can be combined with curtain or drape panels to fit into more traditional plans. Horizontal blinds are another option for sliding glass doors, since they are affordable and easy to install yourself with a screwdriver or power drill. Instead of the vanes running vertically they run across lengthwise, or horizontally, and sit on strings attached to a pulley system. They're made of the same materials as vertical blinds, but their cost is less, starting out as low as $50. The one downfall to horizontal blinds, depending on their quality, is that they often cannot withstand the constant up-and-down motion needed for a high traffic entryway. Horizontal blinds work well with all design concepts and can be combined with other window treatments like drapes and shades. If you decide to use the high quality products like shutters or gliding screens, consider using a local dealer like Budget Blinds or an interior design firm, and replace all your window treatments in your home. Most dealers will provide a better deal if you're able to furnish more than one window, plus you'll add value to your home and have a uniformed design throughout. If this is out of your budget, than do a group of windows downstairs or half of the house. Either direction, whether you use a dealer or put them up yourself, you have several options and many gorgeous outcomes.